Welcome to the NoMachine Small Business Server - Installation and Configuration Guide v. 6. What is NoMachine Small Business Server for? NoMachine Small Business Server is a standalone server for Linux that allows up to ten concurrent virtual desktops to run on the host where it is installed. Designed to offer individual instances of the remote desktop (terminal services), it provides users with their own separate desktop environment. With the Small Business Server each user has his/her own desktop or application, and can store, manage files inside the session and even share his/her own resources with another user. Available for Linux, the Small Business Server accepts connections via a browser (thanks to its built-in web server) or via the NoMachine client. The NoMachine Small Business Server server package includes the NoMachine User Interface which provides the graphical interface (Server preferences) for administering the server and its services. This User Interface acts also as client for running sessions and connecting to remote desktops. NoMachine Small Business Server is a single server (standalone server) to all effects. NoMachine Small Business Server supports up to ten concurrent virtual desktops. A virtual desktop is an individual instance of the remote desktop. Sharing of a virtual desktop is also supported. The number of users is not limited. Visit the NoMachine Support Area to access a variety of online resources including the NoMachine Forums, tutorials and FAQs: https://www.nomachine.com/support. Or log in to your customer area to open a support enquiry. Connections by web and by NoMachine clients are supported. Although compatibility with clients v. 4 and 5 is preserved, it's advisable to upgrade client installations to the same version 6 of the Small Business Server. NoMachine v. 6 is not compatible with the legacy NX version 3.5.0 (no longer supported since December 2016). The update procedure for server and node installations requires all NoMachine services to be stopped in order to correctly replace libraries and binaries. This implies that the Small Business Server is not accessible to users during the update procedure. Current sessions will be terminated, users will be able to connect again later. You can update your installation from our repositories. Just run the NoMachine User Interface from your Programs Menu and access the 'Settings' panel and click on 'Server preferences'. Go to the 'Updates' panel in the User Interface and click on the 'Check now' button. NoMachine has the automatic check for updates enabled: it will check the repositories every two days to verify if updates are available. In this case, the server will prompt a dialog informing that a new version is available but it will never automatically update the current installation. Note: Due to heavy changes between versions 5 and 6, automatic updates are disabled: it's therefore necessary to upgrade NoMachine Small Business Server v. 5 by manually installing packages (see below). includes a 30-day license which is automatically activated during the installation. No further actions are necessary. Such license files have to be replaced with the customer's license files acquired from NoMachine. This can be done via the NoMachine server User Interface in the 'Updates' panel: click on the server.lic and node.lic links to open their license panel and replace the license. You can find a guide for the User Interface usage in the Documents section on the NoMachine web site: https://www.nomachine.com/all-documents. Look for the keyword 'license' to find out in the knowledge base, section 'Articles' how to activate licenses manually: https://www.nomachine.com/knowledge-base. First of all, ensure that the user has a system account on the Small Business Server host: you can create it by using system tools or by using nxserver commands. Empty password is not supported. Once installation is complete, Small Business Server is ready to go. In the login form, the end-user has to provide username and password of his/her system account on the Small Business Server host and connect. From a client device, where you have already installed a NoMachine package type or the Enterprise Client, run the NoMachine User Interface from the programs or applications menu. A wizard will take you through the steps necessary to set-up your first connection, just click on 'Create a new connection'. If you prefer to skip the wizard, click on 'Continue'. I Auto-reconnection is supported: when the connection is lost for whatever reason (including when the client host has entered sleep mode), the client will automatically try to reconnect for as long as the user keeps the User Interface open. If reconnecting is not possible, then the user will have to reconnect manually. NoMachine uses by default port 22 for SSH protocol on Linux.The default port for NX protocol is 4000. In order to change the port for NX protocol, change the port for the nxd service and restart it. See the paragraph 'Connecting by NX Protocol'. To change the port for connections by SSH it's necessary to modify the listen port for the SSH server on the system. from the Server preferences User Interface -> Server preferences -> Network services panel. 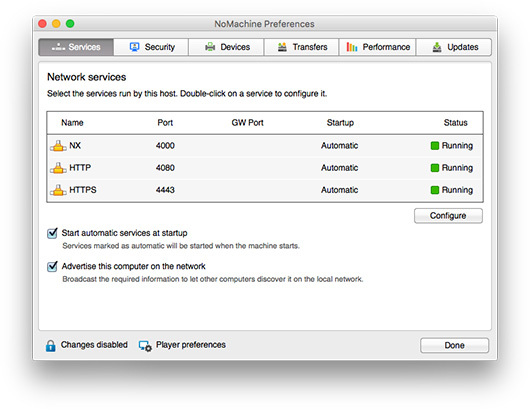 From the NoMachine User Interface you can also change the port where the web server will be listening (by default 4080 and 4443 for secure connections). NoMachine Small Business Server is designed to provide a fully integrated service to deploy sessions on the web which doesn't require additional software to be installed or manual configuration. The minimal Apache web server, nxhtd, provides the necessary modules and is pre-configured to work with the web player application. Specific articles can be found in the Knwoledge Base, https://www.nomachine.com/knowledge-base. Enabling WebRTC allows to use the H.264 video streaming (when possible) or VP8 which optimize the user experience with multimedia applications and content. In the User Interface in the Server Performance panel. The X11 vector graphics mode (previously called 'lightweight mode') is enabled by default for (i) virtual desktops and (ii) custom sessions in floating window mode. This mode is mainly a set of NoMachine techniques to compress and optimize the X11 protocol (by applying the same algorithms available with the NX compression protocol v. 3). These compression techniques are applied to all non-video content like textual elements, while multimedia content is encoded in a video stream (VP8 or H.264). The X11 vector graphics mode is useful for avoiding loss of image quality and in general is the best option when working with traditional User Interfaces or a large amount of text. However it's not advisable for multimedia content or applications with many graphical effects. This mode can also help to reduce bandwidth usage, decrease the HW requirements on client and server (expensive video encoding/decoding operations are applied only to multimedia content), increase responsiveness on slow link and end-users' clients without hardware accelerated video encoding/decoding capabilities. I In the case of slow bandwidth, decreasing the quality level of images could help but if you need to have a perfect image without quality loss, you have to increase the display quality instead. It's also suggested to disable multi-pass encoding to avoid the 'out of focus' effect: multi-pass is an encoding technique which uses multiple passes to progressively reach the best definition of the image. In NoMachine virtual desktops and custom sessions, OpenGL rendering is done by default by software components. This means that rendering tasks are accomplished by CPU and not offloaded onto the GPU. Such operations canbe resource-demanding, especially in the case of 3D desktop graphics effects, and make the user interface look slow. NoMachine Small Business Server comes with a default configuration that grants a working setup for the majority of environments. NoMachine administrators can tune their installation at any moment and according to their specific needs by setting the related configuration keys. In some cases this will require to restart all NoMachine services. Installation and upgrade procedures take care of configuring and starting all the necessary services to make NoMachine Small Business Server ready to accept and serve user requests for virtual desktops and custom sessions. The necessary services are configured to be restarted at each reboot of the host machine. all NoMachine services can be stopped by the Server status User Interface ('Shutdown the server'). When doing so, you will be asked if services must be started at the next reboot or not. You can restart services also from the Server status User Interface ('Start the server'). in the Server status -> Server preferences -> Network services User Interface. You can also choose the start mode: whether the servicehas to be started automatically at the next boot or not. 5353 UDP port for the MDNS service to broadcast computer's information over the LAN. Disable the service by setting EnableNetworkBroadcast 0 in server.cfg. In the Server status -> Server preferences -> Server options User Interface. When the icon is hidden, notification messages will still be displayed when users are connecting. If the displaying of monitor notification messages is disabled, the desktop owner will be unable to accept connection's requests by other users. Configure trusted users if you need to allow the connection without explicit authorization. 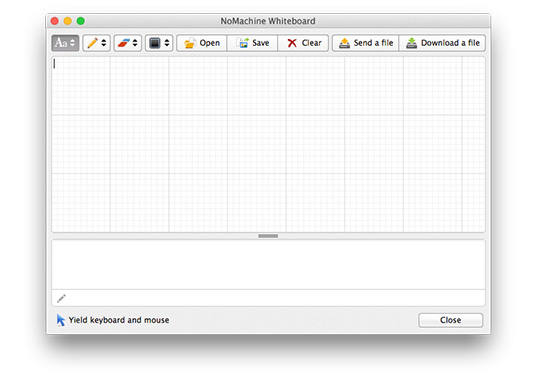 NoMachine provides an instant messaging tool, named whiteboard which allows also drawing, the sharing of files with connected users and fast-track access to file transfer. To access it, connect to the user's desktop and from the Monitor (!M icon) in your system tray click on 'Show the whiteboard'. Note that if multiple users are connected at the same time to the same session, they will all see the same message. When using the NX protocol, NX data can travel on TCP and UDP streams, even at the same time. The client and server can decide dynamically what transport to use, based on the type of data and the network conditions. Client and server negotiate the UDP transport at session startup, after having negotiated the main TCP link. UDP uses symmetric Blowfish encryption, with key negotiated on the secure TCP link. UDP is presently not available when using the SSH tunneling to ensure that all data goes through the same SSH link, as it was in legacy version 3. UDP protocol can be also disabled. NoMachine Small Business Server also provides tunneling of connections using SSH and full integration with any authentication backend supported by the host SSH server. 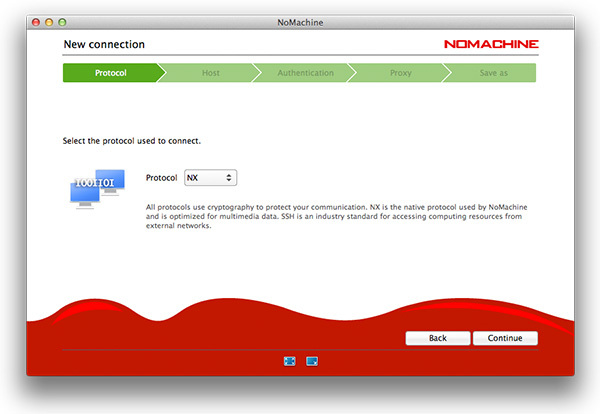 Users can select the authentication method in their connection settings from the NoMachine User Interface in the Advanced panel for the NX protocol and SSH protocol settings respectively. or changed later by modifying the connection settings (right mouse click on the connection icon in the client User Interface to edit it). If you change the port for nxd, connecting users will have to specify the new value in their connection settings in the client User Interface. Users can disable UDP in their connection settings from the NoMachine User Interface in the Advanced panel for the NX protocol settings. The default port used for the SSH protocol is 22 on Linux. On such platform NoMachine relies on the SSH server installed on the system. If your SSHD is configured to listen on a port different from 22 you need to align the NoMachine server configuration accordingly. Connecting users will have to specify such value in their connection settings in the client User Interface. Automatic discover of the NoMachine Small Business Server host is possible only when the server and the user's machine are on the same LAN. When the user connects over the internet or from a different network, it's mandatory to know the public (or external) IP of the Small Business Server. When the server is behind a firewall, you have to configure the router to forward external port to the nxd service (to use the NX connection protocol), to the SSH server (to use the SSH protocol) and to the nxhtd service (to connect by the web). By default the required ports are TCP ports: 4000 for NX, 4080 and 4443 for HTTP/HTTPS and UDP ports in the 4011-4999 range. Note that users will have to specify the external port in their connection settings in the client User Interface. If the router on the server side supports UPnP/NAT-PMP, you can let NoMachine try to enable port forwarding in the router automatically. External ports will be selected randomly from the 20000 - 30000 range. Also in this case users will have to specify the external port in their connection settings in the client User Interface. via the Server preferences -> Network services User Interface by selecting the service and enter its settings (click on 'Configure'). Then check the Gateway port option. Enable or disable user's access to NoMachine EnableUserDB 1 By default all users are enabled to access the NoMachine system once authenticated. With this configuration a user can be disabled and re-enabled at any moment from command line. The Small Business Server is able to handle two types of accounts: system accounts and NoMachine accounts. The latter allows the administrator to separate the system password from the NoMachine password. Forwarded to: this field is applicable only when the server is a NoMachine Cloud Server, so it's always empty in case of Small Business Server. It is possible to define in advance a number of trusted users who don't need the specific owner's permission to connect to virtual desktops run by a different user. physical-desktop Connect to the physical desktop of the Small Business Server host. Take SESSIONID or DISPLAYID from the output of the 'nxserver --list' command, they are the 'Session ID' and 'Display' column respectively. The same output also shows the user's name. You can set a limit for the number of virtual desktops provided that such limit does not exceed the number of connections allowed by the server license value (it's the 'Virtual Desktops' field in the server.lic file). NoMachine Small Business Server allows up to ten concurrent virtual desktops. Pre-requisite to connect by NoMachine is that a desktop environment is installed on the system even if the host is headless or not started in graphics mode. During its installation, NoMachine detects the default desktop environment set on the system and configures the node accordingly. Path and command to start the system desktop environment is defined in the node configuration file by the DefaultDesktopCommand key. The Small Business Server is able to detect GNOME, Unity, KDE and LXDE. If you have a different desktop environment, it's necessary to edit the DefaultDesktopCommand key accordingly. The server configuration provides a number of keys that can be activated to execute a custom script upon a certain event. According to the event, a number of parameters can be specified for each script. In a similar way, a number of keys is present in the node configuration file to allow to execute a custom script on a certain NoMachine node event. In both cases and according to the event, a number of parameters can be specified for each script. You can configure how users will connect to a desktop owned by another user from the Server preferences User Interface -> Security panel. You can basically determine if users can connect or not without asking the desktop owner's permission and if users will be able to interact with the desktop. Allowing connections in interactive mode grants the user full access to the desktop resources and applications. View-only mode is suggested for example when making presentations or teaching a lesson. I Configurations made from the User Interface apply to connections to physical and virtual desktops. If you want to set a separate configuration for these desktops, you have to edit the server configuration manually. in the Server preferences User Interface panel select the 'Blank the physical screen when somebody connects' option. This setting disables also the listing of other user's virtual session in the client User Interface. By default, connections to the physical desktop are enabled and require the desktop owner's permission. The Small Business Server allows users to access and share their devices and resources from locale to remote and vice-versa. Disks, printers, USB devices and more can be connected inside the session to easily access them from both client and server side. At present device sharing is not available with web sessions and requires to connect by NoMachine client. by editing the corresponding keys. The manual configuration also allows the service to be limited to one-way, for example forbid to connect a local printer to the remote host. The next paragraphs deal with manual node configurations in detail. On Linux this service uses the CUPS infrastructure present on the system. With CUPS 1.4 or later, to ensure that users are able to connect a printer from locale to their NoMachine session on Linux , it's necessary that the user already belongs to the CUPS System Group on the NoMachine server host. This is because in order to add a printer to the CUPS system, the 'lpadmin' command line tool has to be executed by a user who belongs to the CUPS's System Group, which can be for example 'lpadmin' on Ubuntu, 'sys' on Fedora, RHEL and CentOS distributions. To forbid network server sharing you must uncomment and set a proper value for the EnableNetworkSharing key in the node configuration file: client Network servers on client side can be connected and made available within the session. NoMachine can video-record all activity made inside the session or on the desktop. To start the recording of the session, users should open the NoMachine menu inside the session (ctrl+alt+0) and click on the 'Recording' button icon to access the Recording panel. From this panel it's possible to open the recording bar, change audio and video quality and open the recording directory to access all recorded files. Session recording is not available with sessions on the web. To record activity made on the desktop, start the recording from the !M icon menu in the system tray of the Small Business Server host and show the Recording bar from there. Desktop activities can be registered on the physical desktop without the need to be connected by NoMachine. The Small Business Server, as well as the other NoMachine client and server products, periodically checks NoMachine repositories (by default every two days) to verify if updates are available and will prompt a dialog informing the user that a new version is available. II You can migrate a virtual desktop session from one PC to another one: the session is disconnected and reconnected on the new client. Behaviors above are automatically available when connecting from client 4.1 or later. The client overrides values set in the ConnectPolicy key in the server configuration. In its default configuration, the Small Busines Server removes the session directory once the session has been correctly terminated. Sessions directories are stored in the /usr/NX/var/log/node/ directory.